Most of this week’s Parsha deals with the tribes, their locations, and their numbers. 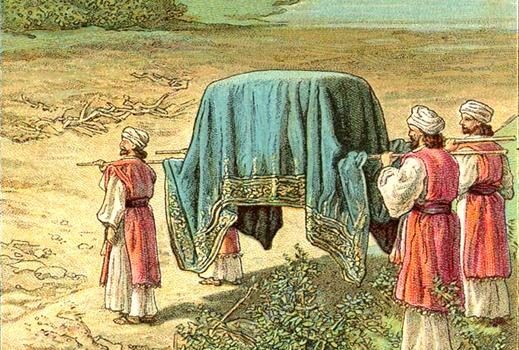 But towards the end of the Parsha, we learn about the Levite families’ jobs in transporting the Mishkan, the Tabernacle. While Gershon and Merari’s jobs were for the simpler vessels of the Tabernacle- walls, sheets, screens, etc., Kehat’s family is the one responsible for the seemingly “holier” vessels- the Menorah, Shulchan, and the Ark itself. Despite this prestigious honor Kehat is accorded, it comes with one condition: “You shall not come and look as the holy [vessels] are covered, lest they die” (4:20). They carry these vessels, but they are not to even glance at them; they had to be covered first by the Kohanim. In discussing this prohibition, many commentaries try explaining the meaning behind it. Some explain it was to ensure their humility- they shouldn’t think they’re much better than other Levites. Others explain that it was to promote a certain sensitivity towards the Ark’s holiness; that nonchalantly carrying the Ark may cause one to look at it that way all the time. But perhaps there is an added, symbolic lesson through this covering, and it’s one that applies universally. While the Levites grew intimately attached to the Torah (housed within the Ark), Gd-forbid should they assume, therefore, that it’s entirely revealed to them. Surely, the Levites were the teachers of Israel, but that’s not to say they knew everything. The Ark was covered as if to teach them that there’s always more to learn; there’s always more of the Torah that they couldn’t see, despite their close connection to it. Many times, we approach the Torah within our established frames of reference: “I know this already, there’s no reason to go to another class about it”; “I can explain this concept, I learned it in High School”; “I can’t think of anything else I’d like to study, I’ll just stay home on Shavuot night”. In truth, no matter what level a person is in their Torah pursuits, we all fall victim to this mentality. But as the covering on the Ark teaches us, even the Levites couldn’t access all of it, there was always more to study. As the Mishnah in Avot reminds us in reference to Torah study: “Rabbi Tarfon said: …It’s not for you to finish the work, but neither are you free from pursuing it” (2:16). Let us take advantage of Shavuot this year, to not only study things we’ve never learned, but to be open to things we think we already learned.